Author(s)/Editor(s): Neugebauer, Jörg; Zöller, Joachim E.
Cone beam volumetric imaging (CBVI) has become an indispensable part of dentistry. Quintessence’s standard reference book on CBVI has been completely revised in order to keep up with the plethora of new developments. The Second Edition is now available in atlas format with large-sized illustrations. 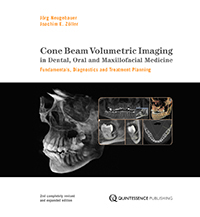 The first part of the book introduces the readers to the basic principles of cone beam volumetric imaging and helps them optimize the attainable CBVI image quality and relevant system parameters for clinical applications. Important aspects of CBVI imaging of the anatomy of the facial skeleton are also discussed. Part II provides multiple case examples for a number of relevant indications and findings for practical demonstration and easy comprehension of the wealth of possible applications of CBVI in dental diagnosis and treatment planning. Part III provides information on the use of cone beam volumetric imaging in implant dentistry. Numerous case examples are used to explain and illustrate the use of cone beam volumetric imaging in conjunction with other CAD/CAM techniques for implant treatment planning, bone augmentation and template manufacture as well as for postoperative evaluation and treatment of complications. This comprehensive work serves as a daily reference of the interpretation of CBVI images and is intended as a reference guide for test preparation for the CBVI certification exam. To deepen their knowledge of the information presented in the book, readers can analyze 30 of the illustrated data sets, which are recorded on the enclosed DVD, using the accompanying software. A tutorial gives an introduction to the use of the software and the routine interpretation of CBVI images.